Ginger and molasses unite in this spicy breakfast bread. Ground ginger and crystallized ginger provide a double dose of the popular seasoning. In a large mixing bowl, combine the flours, brown sugar, baking powder, ground ginger, salt, cinnamon and baking soda. Using a pastry blender, cut in butter until mixture resembles coarse crumbs. Stir in currants and crystallized ginger. Make a well in the center of the mixture. In a small bowl, stir together the egg, whipping cream and molasses; add all at once to flour mixture. Using a fork, stir until ingredients are combined. Turn dough onto a lightly floured surface. Knead dough for 10 to 12 strokes or until nearly smooth. Divide dough in half. Lightly pat or roll each dough portion to a 5- to 5-1/2-inch circle, 3/4-inch thick. Cut each circle into 6 wedges. Place wedges about 2 inches apart on a large ungreased or parchment-lined baking sheet. In a small bowl, combine egg white and water. Brush tops of scones with egg white mixture and sprinkle with coarse sugar, if you like. Bake in a 375 degree F oven 12 to 15 minutes, or until a wood toothpick inserted into a crack in top of scones comes out clean. Serve warm or at room temperature. Makes 12 scones. 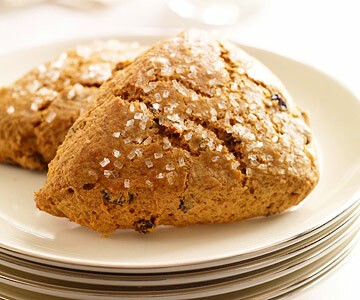 Cool scones completely and wrap in a single layer in foil; place in a freezer bag. Freeze for up to 1 month. To serve, remove from freezer bag. Place frozen, foil-wrapped scones in a 300 degree F oven and heat for 20 minutes or until warm (12 minutes, if thawed).